Tobias Moskowitz says the premise of the book he co-authored with Sports Illustrated senior writer L. Jon Wertheim is simple. "We tried to show that in sports, as in many other areas of life, what people take for granted may not be true," Moskowitz says of Scorecasting: The Hidden Influences Behind How Sports Are Played and Games Are Won. "We try to tie the sports world to some of the things we see in financial markets, and bring the games to our audience in a different light." Moskowitz earned a bachelor’s and master’s degree from the Krannert School, where his father, Herb, was a longtime faculty member. 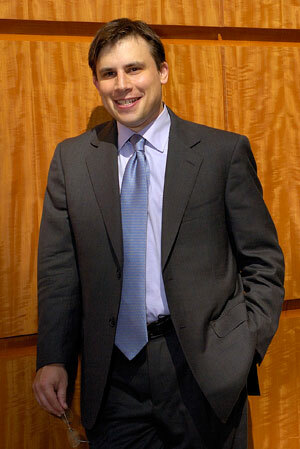 He is the Fama Family Chaired Professor of Finance at the University of Chicago’s Booth School of Business. In 2007, he received the Fischer Black Prize from the American Finance Association as the top finance scholar under the age of 40. He met Wertheim, whose father was a distinguished English professor at Indiana University, on the Indiana junior tennis circuit, where they were doubles partners. They stayed in contact, and talked about writing the sports equivalent of the popular book Freakonomics. Scorecasting was released on January 25, and the authors have been busy promoting the book ever since. They were in Dallas for Super Bowl XLV, doing close to 40 media interviews, including spots on "CNN Morning America" and "NPR Weekend Edition." The book has been reviewed in several outlets, including the New York Times and the Wall Street Journal. Among the topics covered in the book are the worth of top draft picks, the importance of offense vs. defense, and the perpetual ineptitude of the Chicago Cubs. But no topic has generated as much buzz as the discussion of home field advantage. The authors say that the main reason for home team success is officiating. "We found that officials in every sport tend to be influenced by the home crowd," Moskowitz says. "We’re not saying they try to fix games in any way. We’re simply saying they are human beings, and they perform according to human nature."